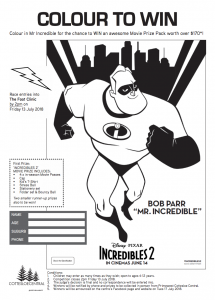 INCREDIBLES 2 COLOUR TO WIN COMPETITION! Enter our Incredibles 2 Colour To Win Competition to be in the running to win an Incredibles 2 prize pack valued at $170. Plus, 2 runner-up prizes! Major Prize winner: Annabelle Nichols, age 10!